For as long as I can remember, I was running late to something. Call it a learned behaviour or hereditary but I know my Mum was the same. I have found though that people are usually OK with it if you are able to give them a heads up. I've had a few people not so happy about it, but I must say, since I became a Mum myself, it sort of gave me a free pass. If you are late because you were doing something for the kids, it seems to be an unwritten law amongst Mums that it's an acceptable reason to be late. I would say because every Mum, no matter how organised, has had one of *those* days. So today I am grateful for Understanding. 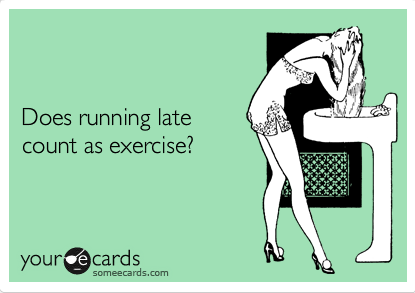 Love the pic - of course it qualifies as exercise LOL!